ChinesePod.com , one of the pioneers for learning languages via podcasts, has recently relaunched their affiliate program, and I gotta say, it’s better than ever. An affiliate program might not mean much to many of you, but I know a lot of folks that read this blog regularly also run their own China-related blogs and sites, and so I figured I’d help the folks over at ChinesePod get the word out about it. For any that don’t know, ChinesePod.com is a rather hip podcast that delivers free daily Chinese lessons in a fun and contextual radio-show format. The podcast and and lesson discussion are free, and if you want to get more involved in their learning program, you just pay for one of the subscription services. I’ve been listening to ChinesePod off-and-on nearly since their inception almost three years ago, and can’t tout the service enough. So, as you may have guessed, I’ve registered as an affiliate – you’re damn right I have. How could I not want to encourage people to use a service that I think is great, that costs them nothing and helps me keep the lights on ’round here. That’s what Michael Scott calls win-win-win. So, if you’re a blogrunner, site monkey or newsletter guru, check out their affiliate program. 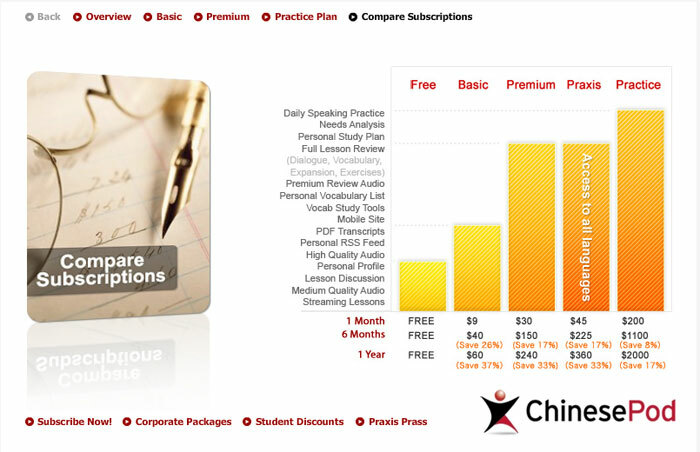 And, if you’re looking to learn Chinese, why not try ChinesePod for free . Incidentally, if you’re at all interested in learning Spanish, they’ve also got SpanishPod , which I’ve not tried, but imagine offers the same high quality content of the Chinese version. See all Farrago, Learning Chinese posts. Tagged: chinesepod, Learning Chinese, mandarin, podcasts. The subscription content on Chinesepod is definitely awesome. Is there some good online tool for learning chinese for a complete newbie, Chinesepod is for advanced users right? @JB: Thanks to friends in high places, I’ll be checking it out very soon. Expect to read my thoughts on my studies there semi-frequently around here. @RandomWanderer: ChinesePod is fantastic for beginners. They run four (more?) levels – newbie, beginner, intermediate and advanced. They’ve a lil’ somethin’ for everyone. Randomwanderer: I would say Chinesepod is actually best for newbies and beginners (just like a lot of formal study material–I think once you’re at the advanced stage it’s often more useful to study on your own anyway). But, yeah, the newbie through upper-intermediate lessons on Chinesepod are some the best you can find anywhere. I have to admit I’m not a big fan of Ken’s Chinese. He makes a lot of pronunciation mistakes which could inadvertantly influence newbies in a negative way. I know it’s his show and all, but he should maybe just stick to speaking English and giving the English definitions of words etc leaving all Chinese to the natives.